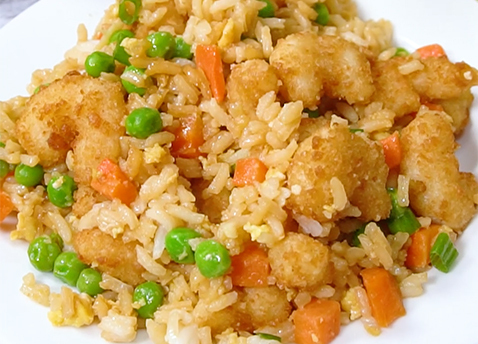 Take it from Nutmeg Nanny: mix crunchy Popcorn Shrimp with fried rice, veggies, and egg, and you get a perfect weeknight meal that tastes the way Friday feels. 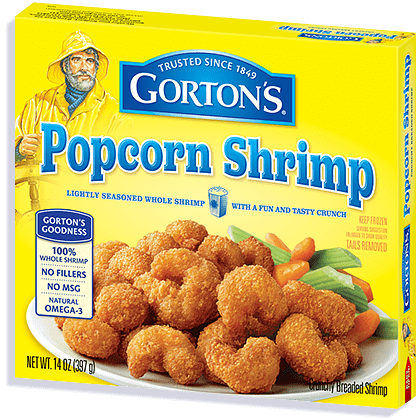 Make Gorton’s Popcorn Shrimp according to box directions. While the shrimp is baking, add vegetable oil to a 12-inch skillet set over medium-high heat. When the oil is hot, add in the frozen peas and carrots, garlic and ginger. Cook for about 2 minutes just to defrost the vegetables. Push the vegetables to one side of the skillet and pour the eggs into the cleared side. Scramble for a few minutes just to cook the eggs. Once fully cooked, mix together and stir in rice and soy sauce. Cook for about 5 minutes until all the ingredients are heated through. Add in the cooked shrimp and green onions and toss to combine.